The Royal Canadian Mint (RCM) is celebrating the 150th anniversary of Canadian confederation, and the beneficiaries of this patriotic birthday bash are coin collectors. The RCM has long been one of the most prolific producers of commemorative coinage, a tradition that traces back decades and notably includes seven of the most popular world coins ever made: the 1867-1967 Canadian Confederation Centennial coins. A special $20 gold coin depicting the nation's coat of arms was also included in the unique seven-coin 1867-1967 proof set. In addition to the seven-coin proof set is a six-coin proof-like set that excludes the gold coin. Both sets are among the most popular government-packaged coin products on the world coinage market, and these hot vintage numismatic items are enjoying more limelight than usual in 2017 thanks to Canada's 150th anniversary. The RCM is reproducing this popular 1867-1967 Canadian proof set with a special silver coin set that faithfully revives each of the seven beautiful designs first seen on Canada's coinage in 1967. The 2017 Commemorative Pure Silver 7-Coin Proof Set includes seven 99.99 percent silver coins bearing the original 1967 designs on silver planchets that are sized according to the diameters of the respective original denominations. While the 2017 proof set includes reproductions of the 1867-1967 copper one-cent coin, nickel five-cent coin, and $20 gold coin, these three denominations will also be minted in pure silver. However, the one-cent and $20 coins are struck with gold plating to more realistically recreate the original color and appearance of those two denominations. Collectors in the United States and Canada can buy the 2017 Commemorative Pure Silver 7-Coin Proof Set directly from the RCM for $234.95 (CAN). However, the maximum mintage of this set is just 20,000, so they may sellout quickly. Those who buy the 2017 silver proof set may also wish to purchase the original 1867-1967 coins that have endured as beloved collectibles since they were first offered 50 years ago. The 1967 Centennial seven-coin proof set and six-coin proof-like set are widely available through coin dealers and are frequently found on online auction websites such as eBay. Market prices are mainly dependent on bullion values. 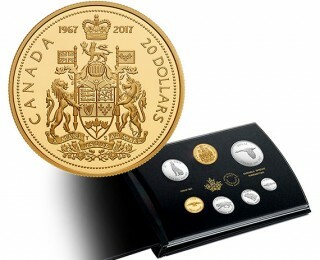 The 1967 six-coin proof-like set is usually available for between $25 and $35, while the seven-coin proof set with the $20 gold coin typically sells for about $750 and up.